Medical Quackery Book Details Bad Ideas In Medicine : Shots - Health News Tobacco enemas? Mercury pills? Ice pick lobotomies? A new book explains how throughout history, miracle "cures" often didn't just fail to improve people's health, they maimed and killed. 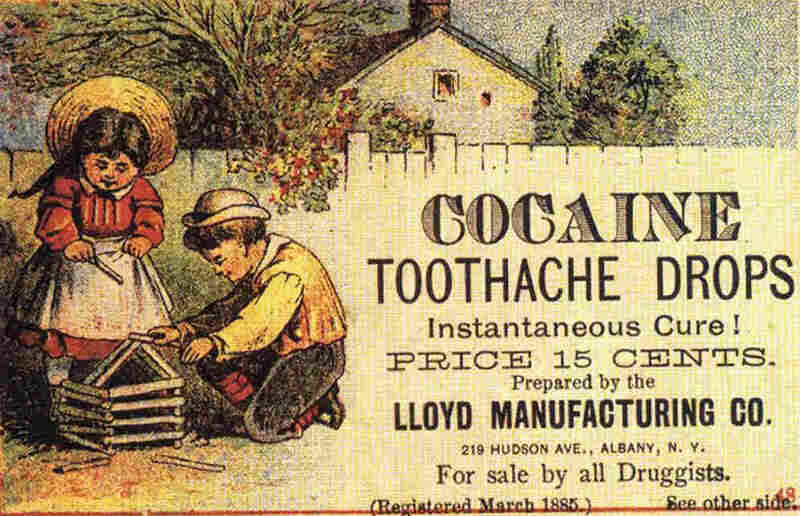 An ad selling cocaine drops for tooth pain, from the book Quackery. Since the beginning of time, humans have been searching for ways to make ourselves feel better fast. Unfortunately, history has shown that many of those ways — cannibalism, cocaine tooth drops, ingesting heavy metals — left us sick, broke, or both. Yet we keep looking for that fast cure. 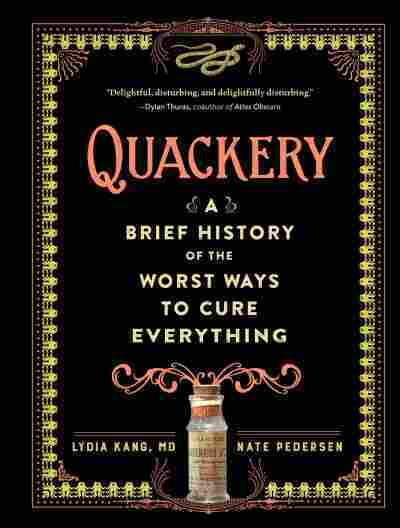 Dr. Lydia Kang, an author and a primary care physician in Omaha, Neb., is the co-author of Quackery: A Brief History Of The Worst Ways To Cure Everything, which publishes Oct. 17. She talked to us recently about her new book, the gross things people have done through the centuries in search of health, and what it means for modern medicine. As a culture, we are always looking for a quick fix, especially for our health. "We are so used to getting things immediately, it's hard to be patient and wait," says Kang. "We're always trying so hard as people to just feel better. We want normal, we want function. When something goes a little off, we are really, really eager to get back." That may have especially been true before physicians truly understood physiology. And before Google. "Let's be honest. People don't go to their doctors first," Kang says. From ancient times through Victorian times, people believed in humoral medicine, the idea that balancing a body's humors or fluids helped maintain health. Black bile (melancholy), yellow or red bile, blood, and phlegm had to be kept in harmony, or the person would become ill. This led to bloodletting, induced vomiting, and a host of other practices that launched industrieThs for leeches, vomiting chalices, tapeworm pills and the like. 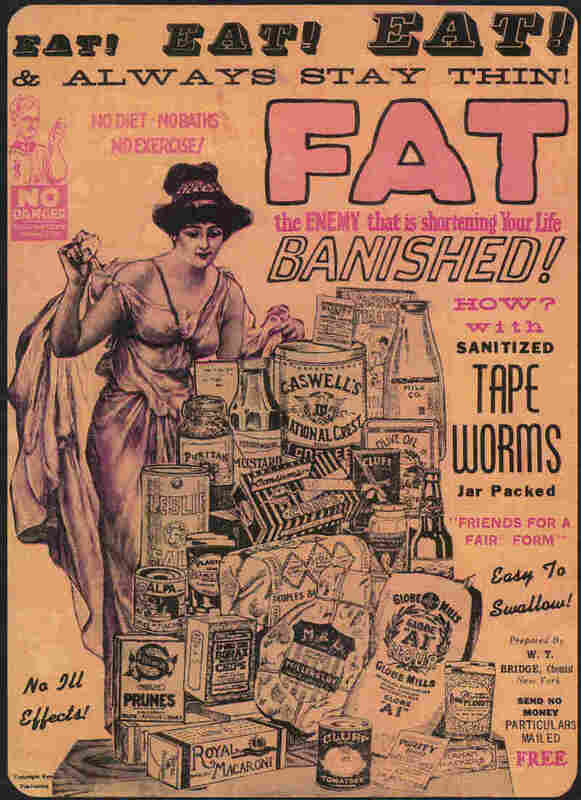 Tape worm pills were once advertised as a way to stay thin. The book includes many examples of people falling for false cures. Cocaine was used to soothe tooth pain, develop a feel-good soft drink called Coca-Cola, and likely inspired and provide fuel for the author of Dr. Jekyll and Mr. Hyde before we realized it was addictive. Using ice picks to operate on the brains of desperate and unfortunate patients with mental health issues sounds like a bad idea now, but the illnesses that drove people to try it persist. "Depression is still a major, major problem," Kang notes, "It's probably more frustrating that we have so far to go." Another bad idea was ingesting metal. Heavy metal pills were so popular in the 1800s that even the future President Lincoln took a pill called "blue mass" that was essentially some flavorings mixed with mercury to "cure" his headaches, mood swings, and constipation, according to Quackery. Lincoln apparently recognized at some point that the pills were making things worse, and actually ramped down his dose while in office. "One shudders to imagine a mercury-toxic, pathologically moody leader of our nation calling the shots during the Civil War," the book notes wryly. Mercury ointments and pills was also a common and unsuccessful treatment for syphilis, which plagued humans from the 1400s until the early 20th century, when penicillin was finally called in. " Similarly, for decades, people thought taking gold pills would cure them of a variety of illnesses. Kang says she can see the logic. "Sun is warm. Gold is like the sun. If we can put something gold in a drink, we can be healthy ... Gold never tarnishes." In one of the odder stories in the book, Kang finds that in the 18th century, people believed a tobacco smoke enema could revive drowning victims. "Instead of putting a life preserver on the side of the bank by the Thames, they put this bellows kit," Kang says, because they believed it would warm the victim and stimulate respiration. Since it did neither, the practice later led to the phrase, "blowing smoke up your arse," i.e. giving someone an insincere compliment. Kang's favorite "cure" in the book is the concept of cannibalism as medicine. "I'm always afraid to say that out loud ... people will look at me funny," Kang says. Why did people think it worked? "You are what you eat ... if you can consume something that was full of vitality, then you can be full of vitality." We're still not completely scientifically-minded when it comes to medicine. When a new (or old) idea comes along and someone we know or admire swears it makes them feel better, we are more likely to go for it, says Kang. "I wish people had a better understanding of bias confirmation — feeling sick and wanting desperately for your bad back to feel better changes your objectivity," she says. As a doctor, Kang tries to convince her patients to research their ideas carefully without talking down to them or shaming them. She recommends reading through a few good medical websites and having long chat with your doctor before attempting anything that might potentially hurt you.